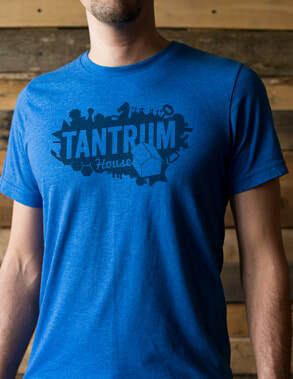 The official Tantrum House Tee of Champions. Also in Cardinal and Gray. Multiply your Meeple with this classy subtle boardgamer shirt. Sorry, this doesn't add to your largest army.... unless you pull a house rule. Does he even have an eye? Probably, but you'll never see it! He's a wild knave. Do you trust me? Check out the back of this sweet shirt. Don't trust me because I'm beautiful. Trust me because I have this awesome shirt. Meeples are awesome! That is why we put one on a shirt. You should buy this one, too. Meeple on the brain? Wutanfallhaus is for the critically thinking boardgamer. It is always best practice to get that shelter built as soon as you can when you are playing Robinson Crusoe! Looking for more? Be sure to check out our Esty Shop where we sell handmade wares and other great geeky stuff. And if you've got ideas for board game shirts or other cool items that you'd like to see us produce, shoot us an email!